This piece was originally published in the April - July 2017 issue of Our Jackson Home: The Journal. Professor Haelim Allen’s office, like the rest of the art department at Union University, is in beautiful disarray. There are paintings on the walls, half-completed sketches on her desk, various models in differing states of completion on a bookshelf, and of course a second bookshelf overflowing with literature that seems a staple of every teacher’s office. Just outside of her office door is a gorgeous light box which fills the hallway with a sense of peace and calm. The building itself is not by any stretch beautiful, but Professor Allen has transformed her office and the hallway leading up to it into a peaceful, welcoming environment. The instant I stepped into her office, I was aware of some external force that drove Haelim Allen to make things with such purpose and beauty. When I stepped into the room to interview her, I dropped all of my previous questions and vowed not to leave until I discovered who Allen is as an artist. Haelim Allen was born in Daegu, South Korea, the fourth largest city in South Korea, and moved to the United States in 1976. “I identify my hometown more in D.C. than in Daegu,” Allen says. “Most of my childhood memories come from the Maryland side of the D.C. suburbs.” She remained in the Washington, D.C., area until grad school when she made the move to Illinois to attend Trinity Evangelical Divinity School. There she met her husband, Dr. James Allen. Over the first seventeen years of their marriage, the Allens moved fourteen times before finally settling in Jackson seven years ago. While she enjoys drawing, painting, and other two-dimensional art, much of Allen’s focus in the past few years has been on installation art. Some of these pieces have been displayed in Memphis, New York, and Baltimore, as well as in Jackson on Union University’s campus. Assimilation was a sort of three-dimensional representation of comfort to Allen’s mother, featuring her passport photo. “Here I am, going from a series of paintings based on my mother’s photographs to my mother’s passport photograph,” said Allen. “What can I do to comfort her?” It’s a piece that’s tied strongly to personal experience, moving from South Korea to the United States and having to deal with many of the complexities and difficulties that arise from having to assimilate to a new culture. 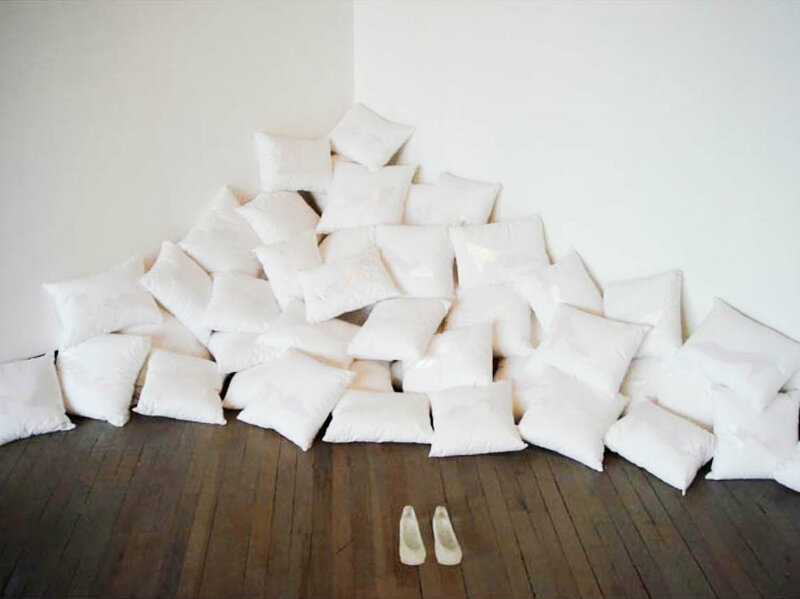 One of her installation pieces, Cinderella Complex, has generated an interesting response from young children who have either seen the installation itself or have seen the slipper prototypes in Allen’s office. Allen emphasized the fact that she was not trying to be critical of either side of the argument. “For me, as a professional artist,” said Allen, “I want to communicate something. I want to start a conversation. I want to probe the work to glean something more.” When the work was shown in Jackson at a Union University art gallery, it was met with perplexity from a wide range of viewers. “Doing this piece,” remembers Allen, “lots of people were puzzled. They looked at the title and asked, ‘What does she mean by death to the domestic goddess?’ It started a conversation. It’s not meant to be negative, and I was trying to prompt people and say, ‘There might be something else to this issue.’” Without saying anything, Allen used artwork to start a meaningful conversation right here in Jackson, Tennessee. I’d already seen how Daegu had influenced Allen’s work, and this was an example of the influence of Jackson, at least to a limited extent. “Would the domestic series have come out if I was not in the region?” she asked herself, trying to discover what really drove her as an artist. “I don’t know. I can’t claim that the two works were inspired by the region. Yes, the student was from Memphis, and yes, whatever I was thinking or going through relates to my experience. So it’s personal to me, but I need to make it more universal. I think a dialogue needs to happen.” And that’s exactly what Allen did with this piece and all the other ones: start a dialogue. The moments of community that arise out of Allen's interactions with her audience are why she loves what she does. “I look forward to those types of experiences. I thank God for her approaching me, for the kids responding, for his coming to me,” she says of those who have approached her about her work. When you step into Allen’s office or explore one of her installation pieces, you feel the sense of community that she has built to foster conversation. Her unique brand of artwork provides a public forum to discuss ideas that transcend all socially constructed boundaries, leading to a healthier community. To learn more about Haelim Allen and the rest of the Union University Art Department, visit their website. Clark Hubbard is a Political Science and English double major at Union University. He loves all kinds of writing, especially short stories, screenplays, and political essays. Clark also participates in a ludicrous number of extracurricular activities for which he has no time, including debate, improv, and making coffee as a barista on campus. Clark's spirit animal is John McClane from the Die Hard series.